Wife of the late Wilbur Tracey; Mother of Deborah Solomon; Janis Tracey, Marsha Tracey, Stacie Chapman and the late Joseph “Buster” Tracey; Sister of Ann Fultz, Lorreece, Brenda, Stephen, John, Charles Curtis, Karen, Connie, Donna, Marvin and Vaughn and the late Gwendolyn , Joseph Jr., William and Phillip also survived by a host of grandchildren, nieces, nephews, cousins and friends. Funeral Service will be held on Monday, Nov. 26, 2018 at 12pm in the Samuel J. Jones Funeral Home 2644 Wylie Ave. Pgh, PA 15219 with visitation two hours prior to the service from 10am until time of service at 12pm. Interment Greenwood Cemetery. To send flowers or a remembrance gift to the family of Lillie Mae Tracey, please visit our Tribute Store. 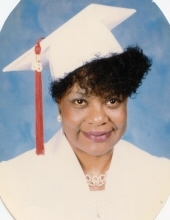 "Email Address" would like to share the life celebration of Lillie Mae Tracey. Click on the "link" to go to share a favorite memory or leave a condolence message for the family.